Win With Words is the award winning accelerated learning curriculum developed by Ms Rennu of Genius Kids. 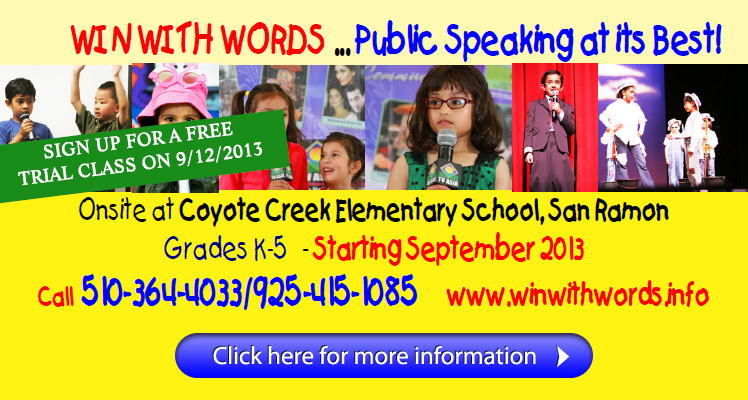 Win With Words is offered as a license locally and internatiionally, which focuses on the development of public speaking, communication, speech and confidence, reading and writing in children ages 3-15.
International licensing information is available by contacting Rennu at rennud@gmail.com. In 2001 the founder of Genius Kids, Rennu Dhillon, had a vision – to teach every child to “Think Lead and Communicate”. The first Genius Kids was opened in August 2001 offering summer camps teaching science incorporating public speaking at the same time. This was a phenomenal success leading to the development of an award winning curriculum which incorporates public speaking in every subject taught. Since 2001, hundreds of children have emerged from the program and Genius Kids prodigies stand out in any crowd with their beaming personalities, public speaking and confidence. Visit our video gallery to meet some of our students. Genius Kids has been featured on several networks to include CNNmoney.com, KRON 4, NBC, TV Asia, TV 5 Monde and SONYEntertainment Asia Television. Dhillon has been quoted in several publications and won awards worldwide for her commitment to education. She is a guest speaker at several events.